A blood clot in the leg—known as deep vein thrombosis—can pose serious health risks. Deep vein thrombosis occurs deep within the body and the blood clot is often gelatinous and solid. Deep vein thrombosis commonly occurs in the lower leg or thigh but can occur elsewhere in the body. Your doctor may refer to a blood clot in the leg as thromboembolism, post-thrombotic syndrome, or post-phlebitic syndrome. Complications can arise in deep vein thrombosis cases when the blood clot dislodges itself, allowing it to travel through the body. If the blood clot makes its way to the lungs, it is known as a pulmonary embolism, which is a life-threatening condition. Deep vein thrombosis can also contribute to lasting problems such as muscle aches, swelling, and color changes of the skin. Annually in the U.S., an estimated 350,000 to 600,000 individuals will develop a blood clot in the leg. Below you will learn more about the causes, symptoms, and treatment for a blood clot in the leg and how you can further reduce your risk of developing one. Complications that can arise if a blood clot in the leg is left untreated include pulmonary embolism where the clot travels to the lungs and postphlebitic syndrome, which causes damage to the veins and impairs blood flow and can occur years after a blood clot in the leg forms. When to seek a doctor for DVT? In some cases, a blood clot in the leg may resolve on its own but if you have other risk factors which increase your risk of complications then you should see a doctor immediately. If swelling is present or severe pain seek out medical attention immediately. If deep vein thrombosis is accompanied by chest pain, shortness of breath, difficulty breathing, fainting, or any other concerning symptom call 911. Prognosis for DVT is often positive as it can resolve on its own or with proper treatment. If a complication arises, though, such as pulmonary embolism (PE) than prognosis can be more severe. About 25 percent of those with pulmonary embolism will die suddenly even though they have only experienced one symptom. Nearly 23 percent of PE patients within three months of diagnosis will die, 30 percent will die within six months after diagnosis, and 37 percent will die at around one year after diagnosis. It’s important that DVT is diagnosed early on and treatment is administered in order to reduce the risk of PE along with other serious complications in order to improve prognosis. Doppler ultrasound: This test uses high-frequency sound waves that create a visual of the veins. Although the most common test, in rare cases it may miss a blood clot. Venography: A liquid dye is injected into the veins in order to obtain an image of them. The dye will highlight blood flow and any present blood clots. Impedance plethysmography: Electrodes measure volume changes. This test is rarely used as it often doesn’t detect clots as well as an ultrasound. CT scan: A CT scan will provide a detailed image of the veins in the legs. A CT scan is more effective at diagnosis a pulmonary embolism as opposed to DVT. 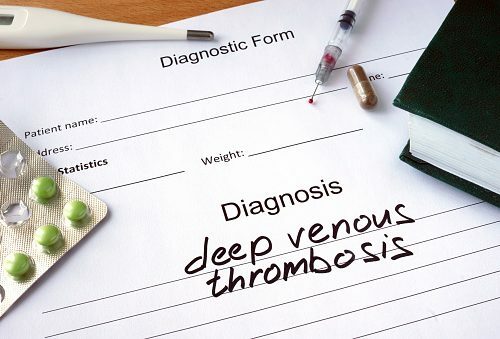 The goals of treating DVT include preventing the blood clot from increasing in size, preventing pulmonary embolisms, preventing post-thrombotic syndrome, and preventing reoccurring blood clots. Medication is often used to treat DVT, specifically anticoagulants (blood thinners). Your doctor will recommend a time period to take the anticoagulants for and determine if they are still needed afterwards or if another course of treatment is required. Other treatments your doctor may recommend are the use of compression stockings in order to prevent swelling or having a filter put into the abdomen if you are unable to take blood thinners. Blood clots are preventable with some helpful lifestyle changes. For example, always ensure you are taking medication as prescribed, especially post-surgery if you have been directed to take blood thinners. Avoid long periods of sitting or staying in bed. Even while sitting, it is best to avoid crossing your legs as this limits blood flow. If you have to take a long overseas flight, ensure you take moments to stand or walk the aisles as well. Losing weight and not smoking are also effective measures to prevent deep vein thrombosis. Lastly, exercise can improve the function of your heart as well as boost circulation. These tips are simple and can help you avoid pain and additional medication to treat the blood clot.